It is an amazing thing to discover what actually took place within you the day you “believed on the Lord Jesus Christ and were saved.” Yes, Jesus came to you as He promised, but how did He come? Jesus said in John chapter 3, “You must be born again.” This means that each of us is in need of a spiritual birth. The moment you were saved, Jesus came into your life through the person of the Holy Spirit. But, that’s not all. Jesus said in John 14 that His Father also came into your life. This amazing mystery is possible because the Holy Spirit is called both the Spirit of God the Father, and the Spirit of Christ (Matthew 10:20, Romans 8:9). Think of it…the unity, the harmony, and the fellowship of the Godhead have entered into your life when the Holy Spirit took up residence within you. Even if you can’t understand or imagine the truth of it, you can believe the truth of it! No one in the Godhead—not Father, Son, or Holy Spirit—is nearer to you, or loves you more than the other. Each One is daily involved in your life in the deepest way possible. 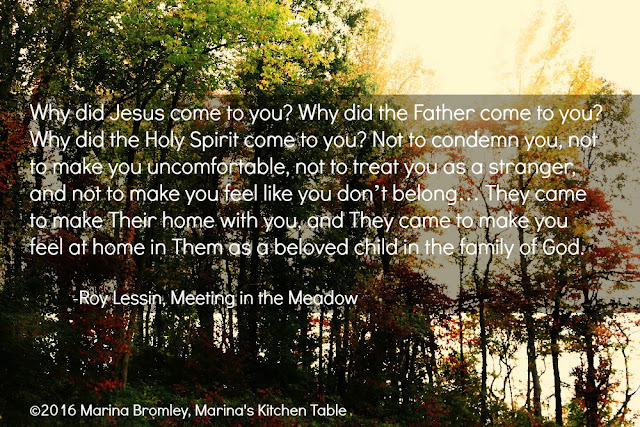 Why did Jesus come to you? Why did the Father come to you? Why did the Holy Spirit come to you? Not to condemn you, not to make you uncomfortable, not to treat you as a stranger, and not to make you feel like you don’t belong… They came to make Their home with you, and They came to make you feel at home in Them as a beloved child in the family of God.